So I spent some time thinking about what could satisfy my cravings but still keep my blood sugar steady. At first I thought it was hopeless, but then it hit me; scones! I love scones, their slightly crumbly yet somehow buttery texture goes perfectly with a nice cup of tea. The fresh blueberry in these add some moisture. Whisk together flours, baking powder, salt and sugar. Add butter. Using your finger tips or a pastry cutter, cut butter into flour mixture until it has a crumbly texture. Add buttermilk and stir with a fork until the dough just comes together. Using your hands, make a large ball with the dough, then roll it out until it’s about an inch thick. Using a round cookie cutter that has been floured, cut the dough into rounds and place on a baking sheet. Whisk the egg yolk and brush on scones. Bake in a preheated oven at 425 for 12 to 15 minutes. 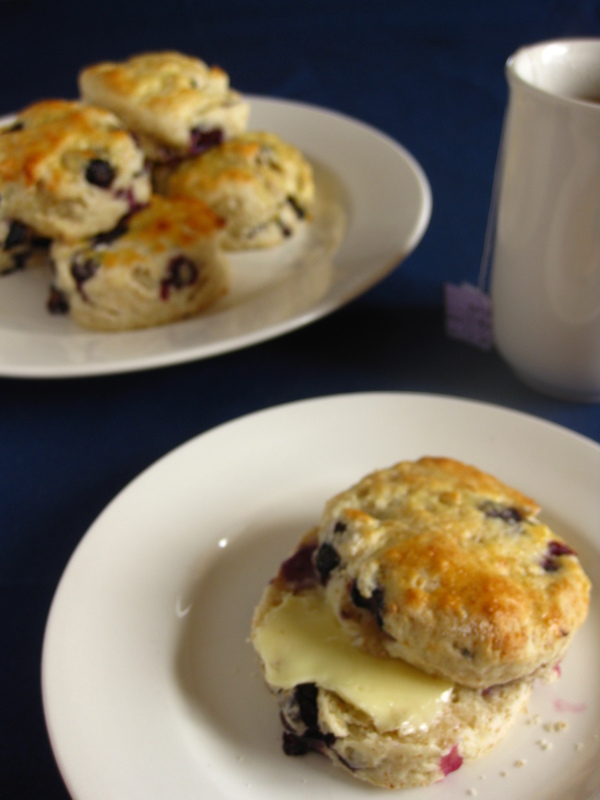 Scones are my favorite breakfast food… I can’t get enough of them. These look terrific! But when you have such fine ingredients in a single recipe, how can you go wrong? I never met a scone I didn’t like. Minnesota has a bumper crop of blueberries and this is the perfect recipe for them. I like this recipe because it isn’t loaded with sugar. With such wonderful sweet fruit, we don’t need to add gobs more! Yum…. I love blueberries and scones. Winning combo! Lovely recipe, buttermilk in the muffins is a good add. Nice to be here. best wishes. I too have a problem with sugar/baked goods…but hey, there are worse things, right? These scones look lovely and I bet they make a wonderful breakfast! Your scones look delish. They have this buttered, perfectly browned top, awesome job! I just made my first ones this weekend and I am addicted now. I feel for ya with cutting back on sugar, it is so hard when baked goods are so much better! Have you ever tried baking with an alternative sugar? These scones look amazing! What a great post. Looking forward to following you! I love buttermilk scones!! aren’t they just the best!